NuLeaf Naturals CBD oil is one of the highest quality oils we have come across. There are some negative points as with anything. First and foremost would be the relatively high price, although you can bring that down by buying in larger quantities. It also doesn’t taste amazing to some people, although others like that natural hemp flavor. What we can say is that it does the job as promised. Today’s review is of the NuLeaf Naturals CBD oil 725mg bottle. This brand has consistently been one of the names we came across when talking about CBD oil, so we were happy to finally be able to review it. Let’s see how they matched up in this competitive category. Considering themselves a hemp company, NuLeaf Naturals has been around since 2014. As opposed to a lot of CBD brands, NuLeaf actually has their hemp grown here in the US. They’re based in Colorado where they grow their own hemp, harvest it, extract from whole plants, and sell directly to customers. As one of the few companies that focus exclusively on CBD oil, NuLeaf definitely puts their emphasis on quality over cost. 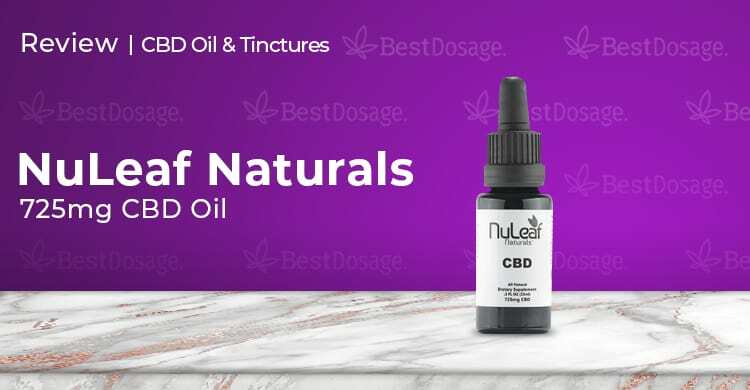 NuLeaf Naturals CBD oil comes in a variety of bottle sizes, starting at 240mg and going all the way up to 4850mg of CBD. This is a 100% organic product and is created through supercritical and subcritical CO2 extraction methods. That part is important, as it is considered the purest way to extract CBD from hemp. Continuing on the topic of safety and reliability, you should know that NuLeaf Naturals CBD oil is 3rd party lab tested. All of their oil is of the full spectrum variety, so you’ll get numerous cannabinoids, not just CBD. They also sell a CBD oil product for pets, but that’s it. There’s something very innocent about the way NuLeaf Naturals CBD oil is packaged. That was the first thing we thought when we received our bottle. For the far majority of companies, there is a lot of time spent into packaging for the purpose of marketing. They’ll have elaborate logos, colorful imagery, and various claims written on their bottles. NuLeaf Naturals has none of these. It’s a plain bottle, the logo and writing are in black and white, and only relevant information is printed onto the label. It was refreshing to see this approach, but if it was a brand that we didn’t know had a high reputation we might have wondered if it was a knockoff. Opening it up, we noticed the dropper was high quality. This matters because it’s eraser to micro-dose and not accidentally let out more drops than you would like. That’s especially important here, because of NuLeaf’s high CBD count, but we’ll get to that later. The taste of NuLeaf Naturals CBD oil is, well, for a lack of a better word: earthy. It doesn’t have an artificial flavor to mask it, so it can be on the bitter side for some people. The nice part about this is that it feels very natural as if they just extracted the good stuff from the plant and you can feel like you basically bit into one. Some of our team liked this approach, others didn’t. Each drop of this oil contains 2.4mg of CBD and the serving size listed on the bottle is 10 drops. That’s 24mg of CBD of course, which might be too high for newer users. Your best bet is to take less than that, to begin with, maybe start with 4-5 drops and work your way up. If you’re already used to CBD, then 10 drops could be a good place to start for you. As with all CBD products, it’s always better to start low and move up than the other way around. Results will vary for each person, as CBD is a very individual experience. That being said, we were very happy with the results. For anxiety, it worked almost instantly and allowed our team member to find relief. The same went for pain, as that set in very quickly. The results for insomnia were more mixed, but that would be the only mark on an otherwise stellar performance. NuLeaf Naturals is based in Denver, and you can reach them Monday through Friday from 9 am to 5 pm local time. You can also reach them by email, where we found response times were quick. The only thing missing is a live chat option, but they do offer great support via email and phone. Free shipping on all orders in the USA – can’t beat that! Average delivery time is only 2-3 days. Ours arrived in only 2 days, so all in all, we were thrilled with their shipping. $99.00 for the 725mg bottle. The full price range is $38.50-$439 per bottle depending on its size. You can also buy in packs of 3 or 6 bottles, which brings the price down some. NuLeaf Naturals CBD oil is one of the highest quality oils we have come across. This might be because they only produce CBD oil and no other CBD products. In this day and age, that’s a brazen approach, but we can’t argue with their results. There are some negative points as with anything. First and foremost would be the relatively high price, although you can bring that down by buying in larger quantities. It also doesn’t taste amazing to some people, while others like myself appreciated that natural hemp flavor. What we can definitely say is that it does the job as promised. NuLeaf Naturals take a no-nonsense approach and they clearly focus on quality above all else – including costs, marketing, etc. If you’re looking to try CBD oil for the first time, this is a great product to start with. If you aren’t new to CBD, but haven’t tried NuLeaf Naturals yet, you really should give it a shot. This is a premium quality CBD oil that deserves your attention. You may very well end up falling in love with it.